This set comes with 2 French Oak wine barrel bases one with a 28 bottle wine rack the other with a lazy Susan shelf. Both bases have cabinet door access to the inside of the barrel. Table top is made from solid white oak with solid white oak trim, no plywood or veneer. Set includes 4 wood stools made from the actual wine barrel staves. Will this table top and barrel set survive outdoors and be weatherproof? BEST ANSWER: Unfortunately this item is not weatherized. You may be able to treat the wood yourself if you intend on using outdoors. Can this set be placed outside? Is it weatherized? We live in So CA. Thxs! Can you buy the table without the stools? BEST ANSWER: No, the table is not sold separately. does this item require assembly?? It’s really just a matter of placing the barrels and then balancing the top. Can we get a different finish on the table top? Darker? To better match the barrel? 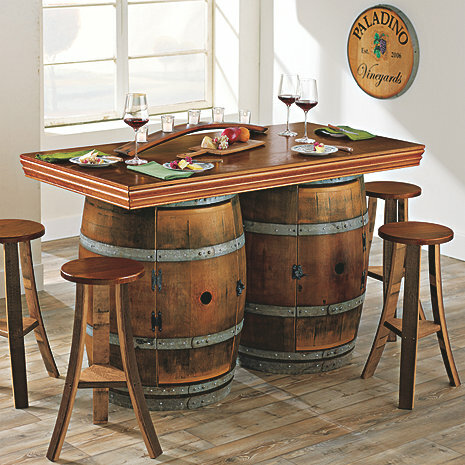 BEST ANSWER: The Reclaimed Wine Barrel Bar/Island Set has a table top which is made from solid white oak which is stained a warm cherry color, the same color as the stools, and does not come in any other color. BEST ANSWER: The Reclaimed Wine Barrel Bar/Island Set stools are 26 inches high and 12 inches in diameter. What is the stain color of the top and stools? BEST ANSWER: The name of the finish is Early American. Thank you so much for responding back so quickly. Is there a possibility of getting a sample of the wood showing the color? Little late in writting this review but we love this island it is more than we expected for the price. Very solid and built very well. We are thinking about buying another one for our daughter since she is in love with ours.